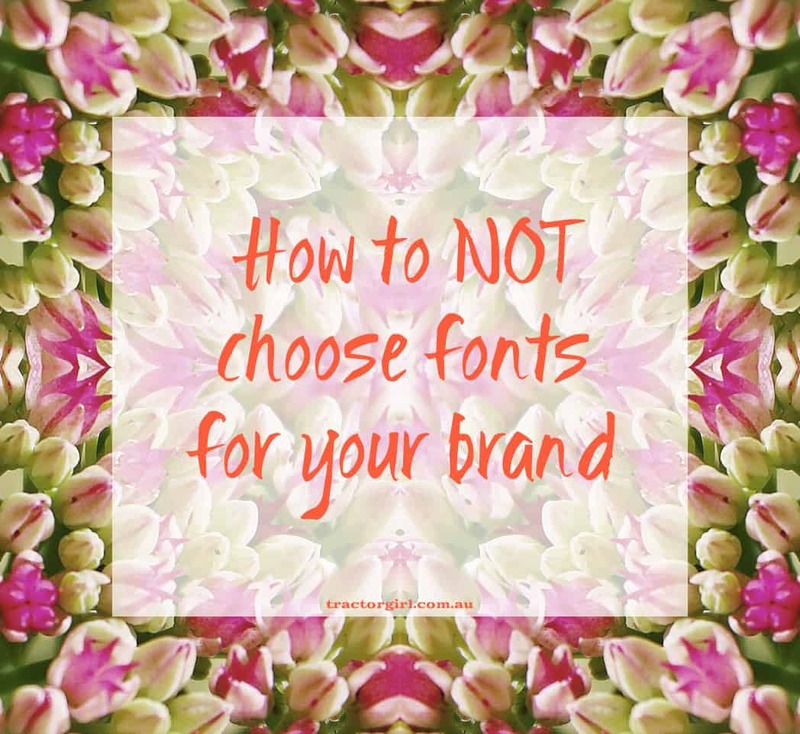 After teaching people how to use Canva for more than two and a half years, I’ve come across more people than I care to remember that just choose whatever font they feel like on the day to create the graphics for their business with. That’s a big fat NO from me. Don’t ever overlook the power of the details. Fonts are super important because even though you think they might play a subsidiary role in your branding, keep in mind that every little element that you have within your visuals can either reinforce your business personality and project that, or it can undermine it. So, if you take notice of every little detail, then you are well on your way to getting projecting exactly what you want your brand to say. Fonts help to create mood through their SHAPES. We innately know that flowing, soft shapes feel more feminine, while angular, more geometric shapes feel more masculine. In fact, there was a famous psychological study undertaken in 1929 – “Takete and Maluma” – that proves this beyond a shadow of a doubt. And there’s a whole bunch of other qualities we can “read” from shapes too – boldness, clarity, tightness, generosity, and so on. Heaps. Choose a font that conveys exactly what you want it to convey. And then stick to it! Because another thing you want to do with your business is to create RECOGNITION, and the most powerful tool to create that recognition is repetition – of colours, of fonts, of image style, etc. I have a couple of very favourite free tools for choosing fonts – the first one is WhatFont. This is an extension that you stick on to your Chrome browser. It’s fabulous because it picks up the name of the font from whatever website you’re looking at while you’re browsing through the web. If you see something that you really, really like and you have no idea what font it is – just click on the app in your Chrome browser and just hover over the font, and it’ll tell you the name of the font as it reads that information from the code behind the website. It’ll tell you exactly what it is without any hassle whatsoever. This means you don’t have to try and take a screenshot, ask everyone and their dog if they know what it is, search for hours on the interwebs trying to find out what it is. It’s instantaneous – hover over it, and WhatFont will tell you exactly what it is. My second very favourite app is WordMark.it. It’s a website that works in conjunction with an extension on your browser, and it picks up all the fonts you’ve installed on your own computer. So when you type in the words you want (like your business name, your tagline, or whatever), it will reinterpret that phrase or that word with all the different fonts. You can then easily scroll through all the fonts and pick out the ones you “kinda like” and then it will group all of those together into a shortlist, so you can compare much more easily. So much easier than testing them all individually within a graphic. Seeing what the actual words look like is super important! Because when you’re choosing fonts, especially for business names or for your tagline – sometimes the fonts that you think might look fabulous actually don’t. For instance, the F’s don’t look like F and instead look “S’s”. Or, the “T” might look wonky and like a “J” instead (like it does on Playlist Script font). So, if your name was “Teresa”, then that font would be out of the question – even though it looks lovely for all sorts of other things. I’m sure you’ve seen a few examples yourself, where the font choice made you double-check what was actually written there. Don’t go overboard and choose 10 different fonts for your brand – two fonts are great for a single brand, or sometimes three. Any more than that and your graphics usually start looking messy. And messy is never a good look, whatever it is that you’re promoting. Whatever you choose, keep it simple – a fancy one for headings, and a plain one for your paragraph text. Don’t have big slabs of text in your fancy font because it’s too hard to read (and the aim of the game is to get that information into your audience’s head, right!?). Don’t make them work too hard, or they’ll simply abandon you and click or scroll away to something easier. So choose wisely. Choose two fonts that help project the personality of your brand and stick to them, so that they support recognition, and they support your brand “vibe”. Even when you've been working in your business for a while, do you still wonder whether your branding looks a bit DIY? Does it need a refresh? Grab my FREE ebook HERE and find out! 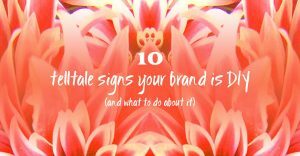 "10 Telltale Signs Your Brand is DIY" will show you exactly what mistakes let you down (and what to do about them).